Chelsea FC grabbed a crucial win against Manchester City as Fernando Torres shined for the home side. 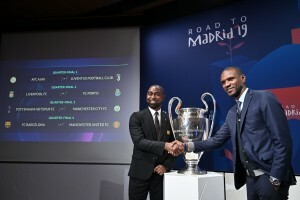 This was match built-up as the contest between two teams who were considered as the favourites for the title this season. Both the clubs had new managers at their helms and Manuel Pellegrini made some tactical changes ahead of this fixture. Manchester City have normally played with two strikers upfront this season, but Pellegrini showed respect to Chelsea and dropped Negredo to the bench. The match started in good pace as both the sides fought for dominance. It was Chelsea who created the first big opportunity of the match and Fernando Torres missed the opportunity to open the scoring. 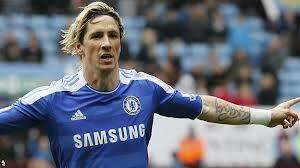 But that miss bought Torres back into life and he turned the match with his superlative performance. Chelsea took the lead in the 33rd minute of the game through Andre Schurrle, but the goal was all down to Torresai??i?? pace, strength and ability to get past Gael Clichy. The Spaniard drove down the right and left Clichy in his wake. The left back couldnai??i? ?t keep with Torresai??i?? sudden burst of pace and strength and the striker picked up Schurrle with a wonderful pass. The German international had the easy task of directing the ball into the back of the net. Just moments after this goal Torres once again ran at the Man City defence, this time down the left his wonderful effort hit the post ai??i?? it was as if the striker was back to his old self once again. But Manchester City came back strongly in the second half and Sergio Aguero, who looked sharp in the first half, scored past Petr Cech with a thunderous effort. The Argentine international was set up by Nasri and the Chelsea goalkeeper was surprised by the pace in the shot at his near post. Both the teams created a lot of shooting opportunities in the second half, but Manchester City perhaps looked the better side. But it was Fernando Torres who had the last laugh in this match. A terrible mix-up between Matija Nastasic and Joe Hart left Fernando Torres through on goal and the striker made no mistake in scoring the winner in the 90th minute of the game. It was a deserved goal for the Spaniard after his wonderful showing in the match and suddenly Chelsea look a much dangerous side with him back in form. This wasnai??i? 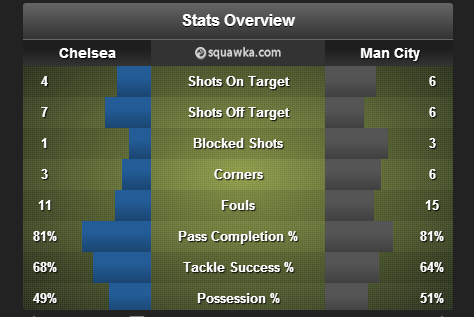 ?t the perfect performance from Jose Mourinhoai??i? ?s side, but it is perhaps a good sign that his team found a way to win it even when they werenai??i? ?t at their best. Chelsea manager Jose Mourinho was delighted with the result and heaped praise on Fernando Torres for his wonderful effort in the game after that early miss. “The goal comes in a very intelligent action by Fernando. (A) misunderstanding by Joe and Nastasic, but Fernando was very clever the way he believed. “Fantastic performance (by Torres) and even better because it was after an easy goal missed. That makes it even more valuable. When a striker misses an easy early chance, many times he’s affected for the rest of the game. It looks like that moment was the moment where Fernando thought ‘I will be the man of the match’. He’s sharp, he’s powerful, the belief is high. We are happy for him, but we are all happy because it’s a very important victory against a team we couldn’t beat last year. “We played against them lots of times; even in friendlies we couldn’t beat them.” ai??i?? The Chelsea manager said. Mourinho celebrated the win by jumping into the crowd and the Portuguese manager said that he was looking for his son. “Chelsea is guilty because I want to buy a season ticket for my son and they give a season ticket for my son behind the opponents’ dugout. They have to give my kid tickets behind my dugout. “I promise that I went for him. But this is the drama of the last minute. “Last year I beat Man City in the last minute in Madrid, I slid on my knees, I destroyed my trousers. I lost in the last minute against Bayern Munich, somebody put a knife in my back. “This is emotion of the game. If they believe that my son is there, great. “If they don’t believe, I apologise if they feel that I did something wrong.” ai??i?? Mourinho added. Further drama took place at the end of the game when Manuel Pellegrini refused to shake hands with Jose Mourinho. But the Chelsea manager said that it didnai??i? ?t come across to him as a lack of respect. “I don’t feel it is a lack of respect. “If he was sad because of the result. I understand. If he was sad thinking that I was doing something wrong by going to celebrate there, I accept that too. No problem.” ai??i?? He said. The Manchester City manager on the other hand mince his words and said he didnai??i? ?t feel like shaking hands. “I didn’t shake hands. I didn’t want to shake hands.” ai??i?? Pellegrini said. The former Malaga manager was left disappointed with how his side dropped all the points due to a mistake at the end. He felt that his side performed well in the second half and deserved something out of the game. “We repeat the story. We had absolutely the control of the game, we played very, very well in the second half. We didn’t have any problem with Chelsea but finally in the last minute we lost. “We are losing stupid points from the beginning. The three defeats that we have away we did not deserve one of them. “The reality is that we have. We have time to (respond). I’m very happy with how the team is playing everywhere, at home or away. Today in a very difficult stadium here against a great team we had the control and we did a very good game.” ai??i?? he added. Fernando Torres was back to his best in this game for Chelsea. When the Spaniard missed an opportunity to score, the Chelsea fans might have feared for the worse, but that was a turning point for Torres in the game as he looked a completely different player from that moment onwards. He set up the first goal as he breezed past Clichy down the right and was unlucky to score in the first half with a amazing strike that hit the post. He kept running at the City defence and put them on the back foot. City struggled to deal with his face and strength throughout the game. Then right at the end his persistence paid off as a mistake from Nastasic and Hart provided him the opportunity to score the winner.Ai?? The above heat-map depicts his movement on pitch in this game.